Rosenfeld Injury Lawyers LLC Law Firm is committed to protecting your interests following an Elgin car accident. Our Elgin Illinois auto accident attorneys will do what it takes to secure the most favorable monetary recovery by building a strong case to negotiate a settlement or take your lawsuit to trial. If you or a family member was injured in an auto accident and are in need of an Elgin car accident lawyer, contact Rosenfeld Injury Lawyers LLC today for a free consultation. Even though the Chicago suburb of Elgin is located in the most western portion of the metropolitan area, its highly dense population of more than 110,000 residents ranks the community as Illinois’ eighth largest city. Historically, the city of Elgin has grown at a rate of 14 percent or more every decade since the 1980s. The expanding population has increased the concentration of local traffic, making the roadways more congested and far less safe than in years past. As a result, many vehicle accidents with injuries and fatalities occur within the city limits and surrounding communities every year that affects many of its residents, visitors and travelers passing through on major highways including the Jane Addams Memorial Tollway (Interstate 90). 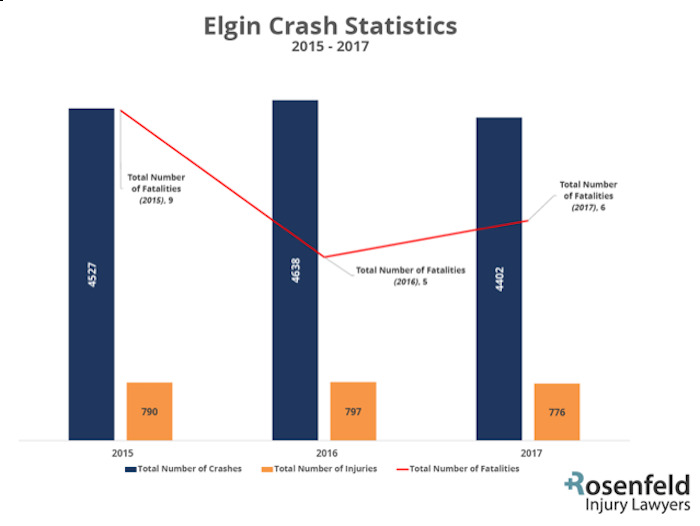 In 2013, four individuals lost their lives in fatal accidents within the Elgin city limits. In February, a single-vehicle accident took the life of a driver. The incident occurred on Big Timber Road just west of North Lyle Avenue. A two-vehicle accident occurred in March of that year on West Lake Street just west of Hilliard Drive. Another two-vehicle accident occurred in July and killed one vehicle occupant at the intersection of Highland Avenue and North Randall Road. The number of fatalities in 2013 doubled from the previous year. The city of Elgin has dangerous intersections, especially at Randall Road (34) and Route 72. Located at the upper right corner of the city of Elgin, this dangerous intersection has long maintained notoriety as Kane County’s number one most hazardous crossroad. The plagued treacherous roadway at the unsafe junction has had many high-profile vehicle accidents in recent years. The intersection of Shales Parkway and Late Street is also extremely dangerous and has been the site of numerous accidents with some involving fatalities. However, the intersection of Big Timber and Route 20 is particularly hazardous to cross, especially for teenagers as they drive to school. This is because Route 20 has a posted 55 mile per hour speed limit with tight turns in the roadway approaching the junction. The roads become especially precarious during the winter months when the street is covered in snow and ice. Local residents living and driving around Route 58 and Shady Oaks Drive on Elgin’s far eastside have long noted the crossroad is a dangerous intersection. Many residents believe that installing a traffic light on the corner could vastly improve the safety of motorists, passengers, pedestrians, bicyclists, and bystanders. Traffic engineers estimate that more than 12,000 vehicles pass through the intersection every day with many accidents occurring at the location each year. Settling an Elgin Illinois motor vehicle accident claim without legal assistance can be frustrating and challenging, especially if you suffer serious injuries or the wrongful death of a loved one. This is because insurance carriers use proven tactics to delay the injury claim or deny it altogether. It is the job of the insurance claims adjuster to save the company money, usually by taking advantage of the injured victim who does not have legal representation. In many incidences, the claims adjuster will search for any reason to avoid paying financial compensation to the accident victim to cover their costly medical expenses. Often times, the accident victim working the claim on their own are under-compensated by the insurance company and unable to pay current medical bills, hospitalization, future treatment, missed earnings, pain, and suffering. If you have been injured in an Elgin motor vehicle accident, the incident has most likely significantly disrupted your daily life at the expense of your health and well-being. It is essential to make sure the accident does not also cost any more of your precious time and hard-earned money. Hiring an Elgin car accident attorney can prove to be the best way to move forward to get your life back in order. Because of the severe automobile accident, you likely need to hire the most skilled legal representation available in your community. A reputable Elgin law firm that specializes in personal injury motor vehicle accident cases will understand the best ways to play hardball with defense attorneys, insurance companies, and claims adjusters to ensure you receive maximum monetary compensation. A lawyer working on your behalf can ensure your receive financial, physical and emotional recovery through an out-of-court settlement or a jury award at the conclusion of a successful trial. 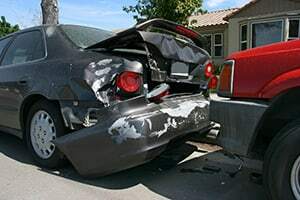 Our team of reputable Elgin car accident lawyers will review the evidence of your case and discuss specifics with you on how a claim or lawsuit can provide you the financial compensation you deserve. Through a legal assessment, your Elgin car accident attorney can determine what parties are at fault for your damages, injuries, and losses. This is important because you are required by Illinois tort law to prove how negligence or intention of another caused your damages. While you might believe the initial step in taking legal action is to make direct contact with insurance companies involved in the accident, it is best to seek legal representation first. Retaining an accident lawyer provides peace of mind and gives you time to focus on healing from your physical and emotional injuries and financial damage. This is because a seasoned Elgin car accident law firm will handle every administrative requirement in filing a claim for compensation. Rosenfeld Injury Lawyers LLC offer a free no obligation, confidential, no-hassle consultation. Our trusted Elgin car accident lawyers have years of experience in handling serious vehicle accidents in Kane and Cook Counties. Contact our offices today at (888) 424-5757 to find out exactly what compensation you might be entitled to receive. Our years of perseverance, skill, and dedication to achieve success can prove financially beneficial to you when handling your claim. We accept cases like yours on a contingency fee basis. This means you pay for our legal services only after we recover financial compensation for you.